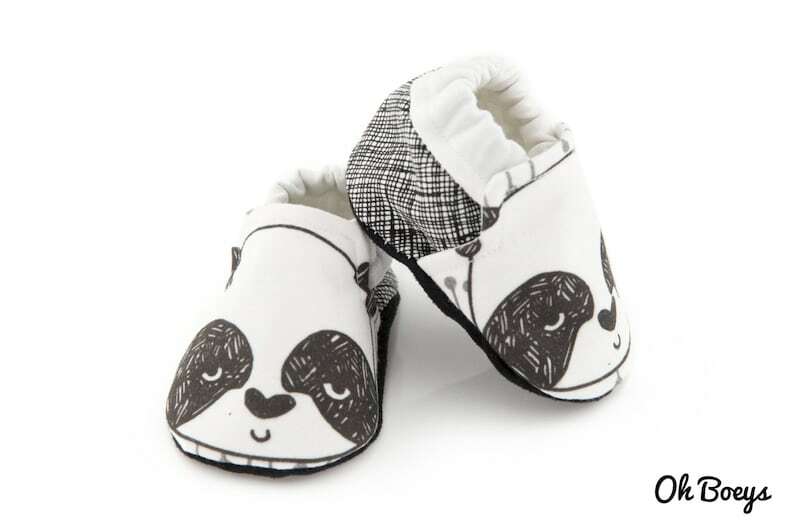 These loafers inspired baby shoes featuring Andrea Lauren panda print are perfect for tiny feet. All our shoes are comfortable to wear because they are made of soft fabrics and feature soft soles to encourage walking among the little ones. Soft sole shoes allow babies to feel their feet when they are learning how to walk. Hard soles shoes can sometimes hinder babies from walking sooner. Our shoes are very easy to wear. Simply slip them on your baby's feet and the elastic band around the ankle will ensure they do not come off easily. This makes our shoes suitable for indoor use among walking (ahem,running) toddlers as well. The fleece inner soles add comfort and warmth especially during the colder months of the year. All our 0-6months shoes are made with faux suede sole, whereas, all our 6-24months shoes are made with anti-slip sole that are still soft and durable for those little ones learning to walk. These sizes are based on average baby feet size, it is best to measure baby's feet and add about 2cm for room to grow. Our shoes are made to order, so it may take up to 5 working days before they are ready to be shipped. So gorgeous and well made I immediately purchased a second pair.